(p1) Robots are part of our lives, and they are about to be even more present. The first example is going to be self-driving cars. 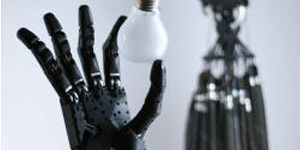 In the next 20 or 30 years, we will start to see serious humanoid robots in our homes. They will do all the things that we see in science fiction. (P2) Robots intrigue people but also scare them. The curator of the Science Museum in London says that this reaction is natural and human. Do you like robots? Why or why not? Do robots scare you? Why or why not?